A venti pink drink with light ice from Starbucks will make my day, and in my free time you can find me spilling the tea and looking at dogs to adopt! Sound 360 Logos — 4 potential logos for Sound 360 I created for the 30 day logo challenge! Sweet Talker Logo — A potential logo I made for a company called Sweet Talker! 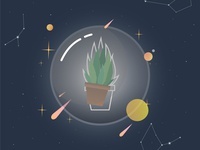 Plant in a Bubble — Protect the plants - Just an illustration I did on the side for fun!